When you stay at Seatac Inn and Airport Parking in SeaTac, you'll be near the airport, within a 10-minute drive of Westfield Southcenter Mall and The Boeing Company. This motel is 12.4 mi (19.9 km) from Seattle Waterfront and 5.1 mi (8.2 km) from Museum of Flight. Make yourself at home in one of the 74 air-conditioned guestrooms. Complimentary wireless Internet access keeps you connected, and cable programming is available for your entertainment. Bathrooms with shower/tub combinations are provided. Conveniences include phones with free local calls, and you can also request refrigerators. Grab a bite from the grocery/convenience store serving guests of Seatac Inn and Airport Parking. A complimentary continental breakfast is included. Featured amenities include a 24-hour business center, limo/town car service, and a 24-hour front desk. A roundtrip airport shuttle is complimentary (available 24 hours). Public areas are equipped with complimentary wireless Internet access. 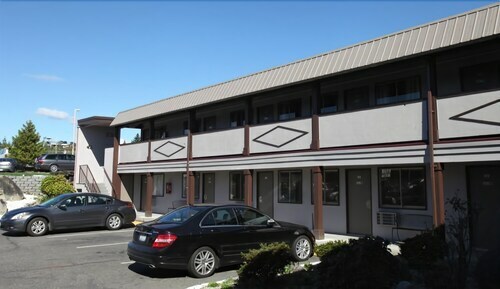 This motel offers access to a 24-hour business center and limo/town car service. A complimentary breakfast is offered. A roundtrip airport shuttle is complimentary to guests (available 24 hours). This SeaTac motel also offers multilingual staff, coffee/tea in a common area, and laundry facilities. Parking is available onsite for a surcharge.